The old, “He’s gone to live on a farm” euphemism isn’t so poignant if you’re actually a farm animal. Maybe your dog is living it up in barnyard heaven, but for the quacking/oinking/gobbling/baaing sort, there’s no such thing as eternal happiness. 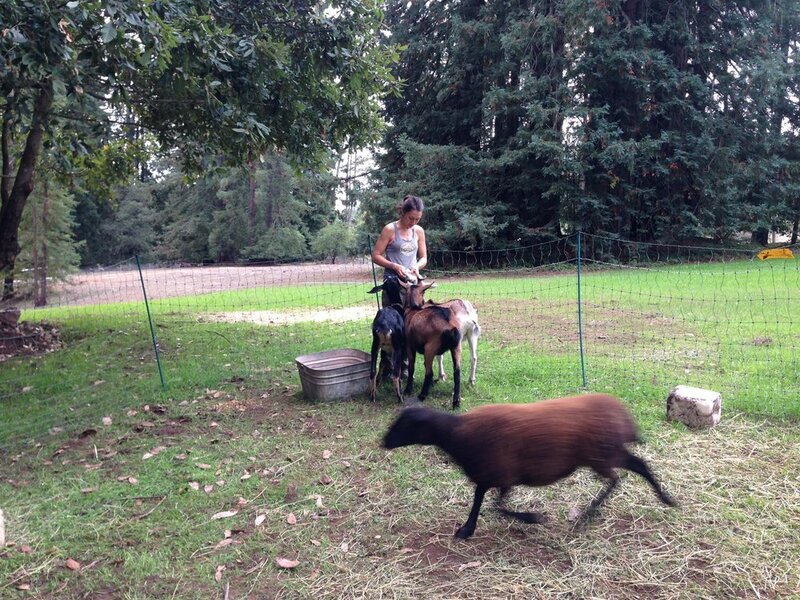 A couple of months ago, I spent some hard working weeks at Flipjack Ranch in the Santa Cruz Mountains. Among other farm chores like gardening, gopher trapping, and canning, most of my waking hours were spent taking care of the myriad animals that lived there. In the early mornings, I’d wake to the sound screeching geese and the occasional ‘Pig Rodeo,’ a rather stressful event that involved chasing down a fleet of 300-pound pigs that had escaped during the night. Farm life is often romanticized as the simple life, but let me tell you, there was nothing simple about my life at Flipjack. You’re constantly forced to adapt (what happens when the well stops pumping water? ), problem solve (how can we get the goats to not strangle themselves? ), and think creatively (let’s blast NPR by the pig pen at night so that the mountain lions think we’re still there.). There are a million and one things to get done, no matter how organized you think you may be. I was sad to leave that life behind, but honestly relieved that every day thereafter wasn’t a giant riddle caked in pig poop and dirty sheep water. Well, if you’ve ever wondered what it feels like to be tarred and feathered, I may be able to give you some insight. For this weekend, I returned to Flipjack to finish the deed. Here’s a photo of the ranch’s chalkboard, with a list of skills we, the WWOOFers, wanted to learn. Since the only things getting butchered in September are loads of heirloom tomatoes, I was told that I’d have to come back if I wanted to get up close and personal with the chopping block. Why, you might be wondering, would I willingly put myself through such trauma as would likely be caused by slaughtering an animal? Here’s my thought process. As a meat eater myself, I believe I can speak for most of us when I say that we are so removed from the slab of meat on our dinner plates and barely consider that it came from something that was once living and breathing, just like us. Forget the ethics of it for a second – I mean, whose right is it to kill and eat whom? How much should a life really cost? Lets not go there – but I have recently felt totally perplexed by my own nonchalance toward meat. In reality, it’s kind of a big effing deal to eat something that once walked and breathed and ate and pooped, rather than, you know, having grown from the dirt. Not to mention, how did my chicken breast fillet get to be a boneless skinless thing, anyway? So, my initial goal in going to Flipjack was to really understand what goes into raising animals for meat. The first leg of my journey taught me a lot. Two weeks of caring for those suckers and I thoroughly understood how much work goes into the ‘raising’ part. What I missed was what it felt like to experience raising a life and then taking it. Well, as you may have surmised, it’s a bad month to be a turkey. Robin and David invited me back to the farm this weekend to learn about butchering. They’d be killing two ducks and two turkeys, so I hopped in my car and headed back from whence I came. It was a rainy morning, and as I drove down the coast, I could hardly see in front of me. The cliffy beaches on my right looked eerie, like the scene from a romance-turned-murder novel. This wasn’t the glowy, dreamlike scenery I’d left behind for city life. It was ominous. Pulling into Flipjack Ranch, I was overcome with a sense of foreboding. It was somewhere between drizzling and raining when David greeted me, decked out in yellow rain gear. I suited up and he led me to the crime scene, where George Washington hung by his feet, blood dripping from his neck into a plastic bin. He had quacked, all right. 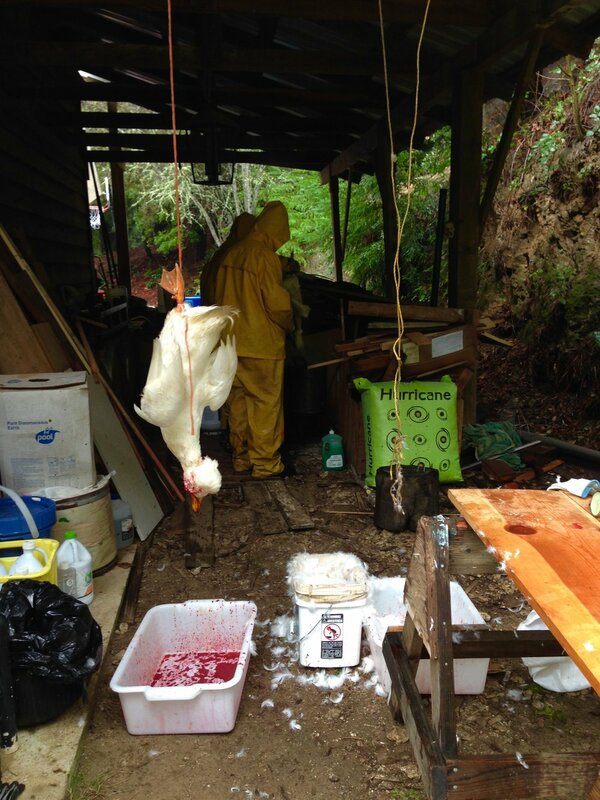 Robin and their WWOOFer, Heather, were dunking the other lifeless bird in hot water to loosen the feathers. I jumped right in, and we plucked away. I learned that these ducks were being prepared for a Chinese couple, who were going to make Peking Duck. As tradition holds, the head must remain on, meaning the good old guillotine method would not do. They had to put the bird to sleep and slit its neck, ever so gently. Strangely enough, when I pictured myself getting up close and personal with the bloodletting, I never really considered what happens after the animal dies. Well, if I thought wrangling those ducks into their coop each night was hard work, dressing a dead one is a mighty task indeed. The feathers, for one, are endless. One of the ducks had gone into molt, which means that the entire bird was covered in half formed quills that, when plucked, leave behind a porous hole. So when all is said and done, the bird is peppered with spongy craters. Lesson learned – do not slaughter a bird after it’s gone to molt. Remember that for next time, people! Once that was all said and done and the birds were wrapped up for sale, we took a lunch break. Lamb Terrine. See this lamb who so skittishly photobombed my adoring goat picture? I can’t believe it, but I ate her. I ATE FLIPJACK! I mean really, she deserved to go. A real weakling she was. But boy, was that a weird feeling. A weird feeling that just so happened to taste mighty delicious. After lunch, it was turkey time. We started with a Broad Breasted White – the kind that, due to America’s taste for white meat, has been bred to have a giant breast. By the time they’re ready to be harvested these turkeys can hardly walk, they’re so top-heavy. Robin picked her up and I put a bag over her head and pulled it through the open slit. This is a smock of sorts to prevent the feathers from becoming stained with blood. She carried it down to the shed, where the stump was waiting. There were two nails in the stump, where the neck slips in to hold it in place. In one fell swoop, David lifted the cleaver and chopped the bird’s head right off. The eyes blinked a few times and the beak opened and closed. The rest of the bird proceeded to spaz out for nearly five minutes, its wings flapping and talons clenching. Its body twisted and turned in a way that seemed to be an expression of pain but was actually just a nerve reaction. Once it stopped seizing, we hung it by its feet. Next, Robin brought bird #2 down, a Bronze this time. I picked up the cleaver and committed to doing this thing. I wasn’t going to hold back or wuss out. This was for real. The bird was put in place and I brought the cleaver up high. I’m not sure what happened, but – and I’m shaking as I type this – I didn’t make it all the way through the turkey’s neck. It flopped around, head half off and inside the bag now. David was able to finish the job in a matter of seconds. I stood back, silent and blood splattered, sure that I’d never forgive myself. I still haven’t quite forgiven myself for what I did to that bird. Not the killing it part, but the half-killing it part. It’s something I don’t think I could have done differently, and I don’t think it’s something I’ll do again. When it came time to pluck them, I couldn’t bring myself to touch the Bronze for a while, so Heather and I plucked the white turkey while David and Robin worked on the other. As we plucked this dead, headless bird, I kept feeling like I was hurting it. When I’d come across a particularly stubborn feather, I’d hesitate as if to spare the bird some pain. While the turkey flailed for a good five minutes after it died, I too had a hard time grasping the very quick transition from life to death. The birds’ bodies remained warm throughout the whole process, from first feather to last organ. If you do think about a gobbling, waddling turkey when you see your Thanksgiving feast, I’ll bet you don’t think about all the in between phases between the two states of being. Though traumatizing, it was utterly fascinating to see the bird go from an animal to a piece of meat over the course of an hour. Once featherless, there’s the evisceration part, and after that, the sawing off the neck part, which is not an experience I care to relive or to remember. When all is said and done, you’re left with what we see in grocery stores across the country all November long. People have asked me if I’ll be able to eat turkey this Thanksgiving. My answer is that I just don’t know. I’ve yet to eat meat since I came, I saw, and I slaughtered, but the wound is still fresh. Fresh enough to make me queasy at the thought, and to make me write this blog post so I never have to tell the story again. I’ll likely eat turkey on Thanksgiving – we’re getting ours from Flipjack, thankfully not killed by yours truly – and I can’t say if I’ll enjoy it more or less, but I’ll feel more satisfied that I’ll truly understand what I’m digging into, when I do.